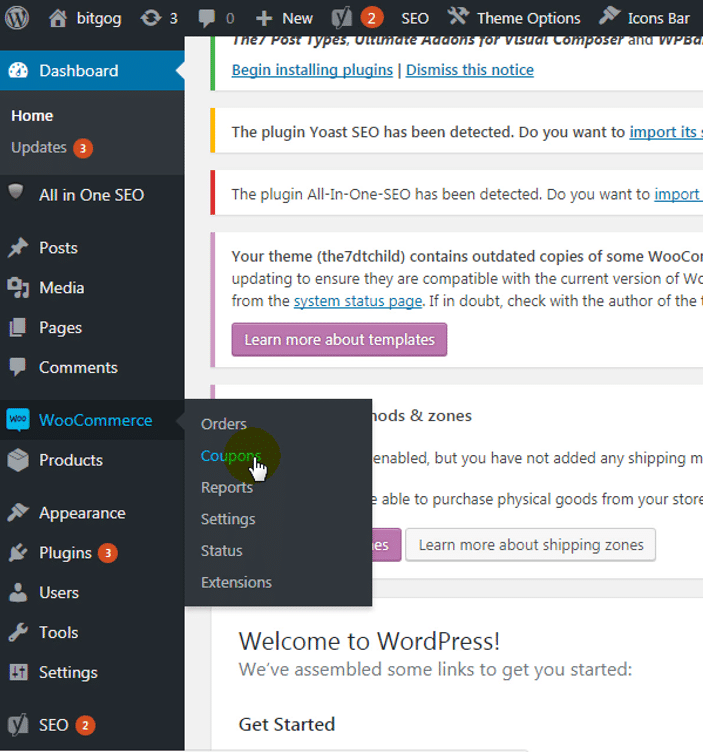 In this article, we will help you how to create a coupon code using WooCommerce (free eCommerce plugin) in WordPress without any programming knowledge. Coupons are a great way to offer rewards and discounts to your customers and increase user engagement on your website. If you are ready to offer discounts and coupons to your customers lets create a coupon. Before adding coupons, do add a few products to your store. If you need any help with how to add products in your WooCommerce store, please follow the steps in this tutorial. 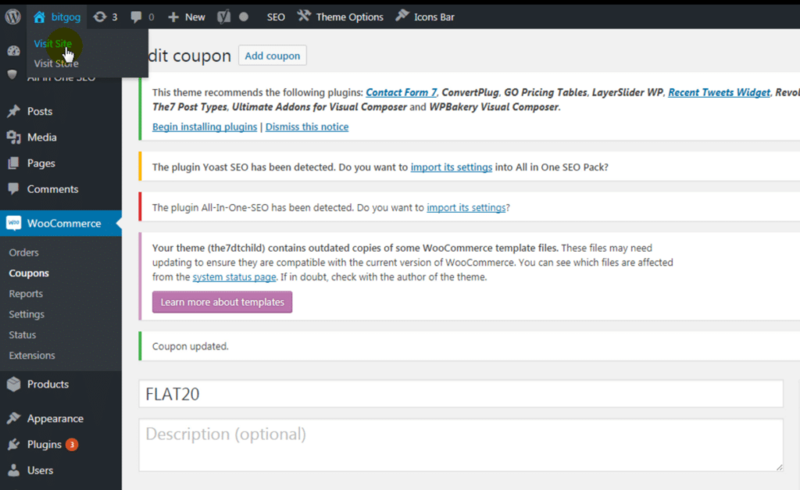 First enable coupons in WooCommerce>settings. Click Add Coupon button to enter a new coupon. Description(optional) — You can specify the information about coupon like Promotion, Dates in effect, Compensation. Let’s start with the first tab, General. 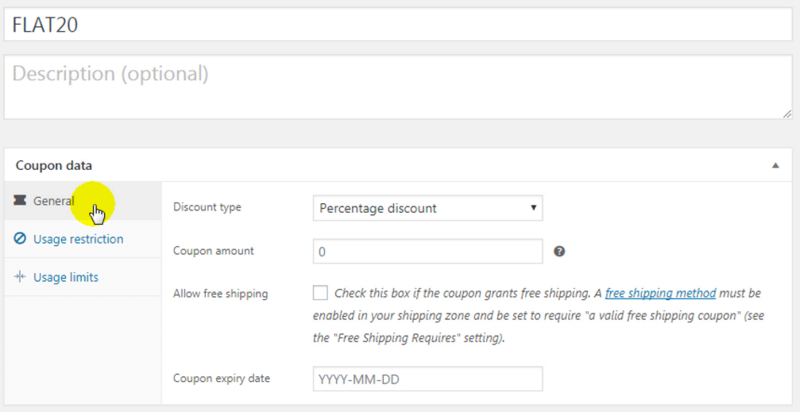 The General tab lets you specify what type of discount you’re offering to customers. Percentage Discount– a percentage discount on all product/s. Fixed Cart Discount– a fixed discount on your whole cart. Fixed Product Discount– a fixed discount on a specific product/s. 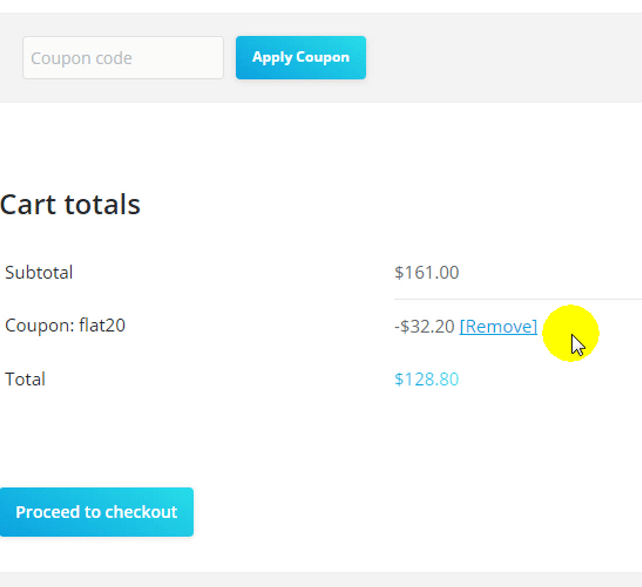 Now specify the coupon amount you want the customer to avail. I have given 20 as Coupon amount and Discount type as Percentage discount which means customers will get 20% off on all the products in the cart. Further down, you can offer free shipping to the customers, simply by checking the Allow free shipping checkbox. At the bottom, you can set coupon expiry date after which coupon will not be valid. When you leave this option blank coupon will last forever. 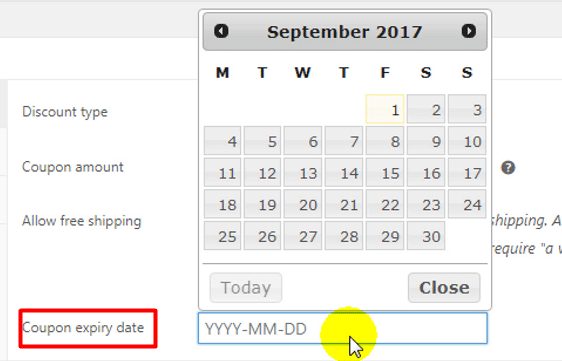 The expiry date is selected from a drop-down calendar. After General settings configured, let’s move onto the Usage Restrictions. Lets discuss about minimum spend. 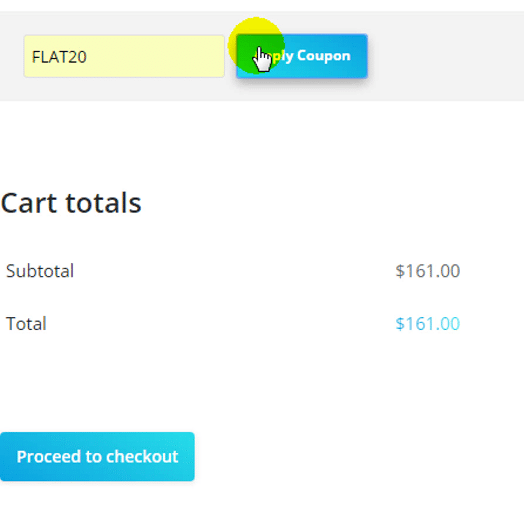 This specify the minimum cart total to access the coupon. For example when you set it to be $200 that means the customers can only avail the offer when the cart total is $200 otherwise coupon will not be valid. 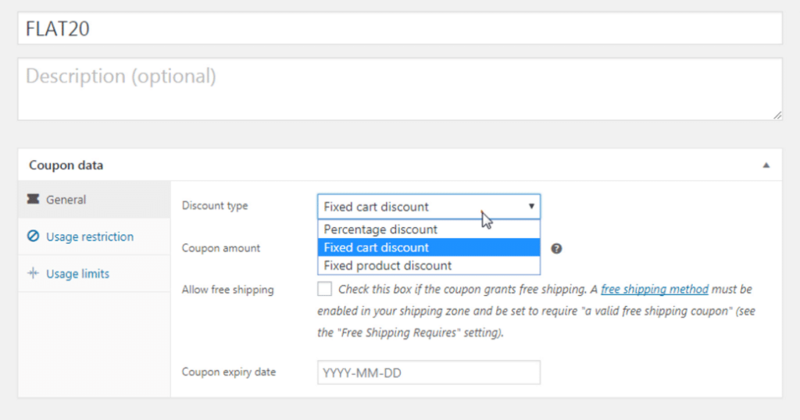 Same with the maximum spend, you can set the maximum value of cart to avail the coupon after that coupon will not be valid. Individual use only means that this coupon can’t be used in parallel with any other coupon. When you don’t want customers to apply two different coupons to the same cart. 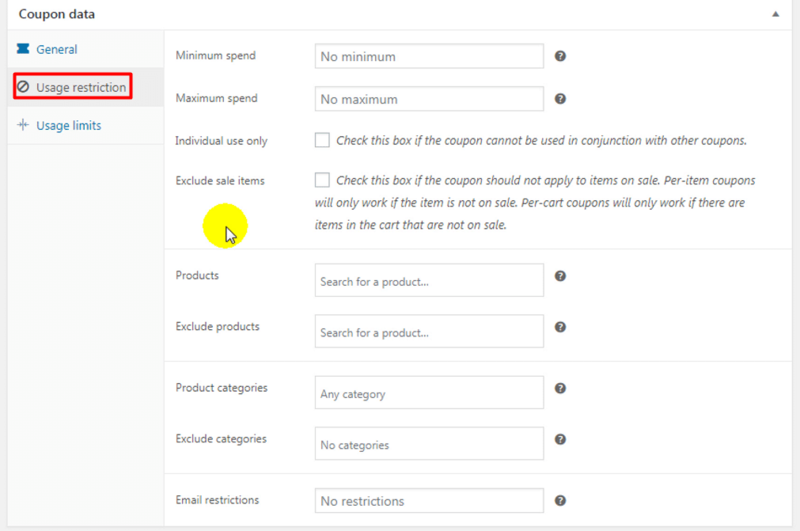 Checkbox Exclude sale items when you don’t want to apply the coupon to the sale items. Next in Products you can enter the Products that the coupon will be applied to, and in Exclude products enter the products on which coupon will not be applied. WooCommerce helps you find your products easily: You can either input the first three letters of your product name, or the product ID. So you can add Product Categories on which coupon will be valid and also Exclude categories on which coupon is not applied. Email restrictions – Email address or addresses that can use a coupon. Verified against customer’s billing email when an order is placed. The final tab is labelled Usage Limits. This tab lets you restrict how many times your coupon can be used – either per customer, or total uses. First field ask you about how many times a coupon can be used. For example when you set Usage limit per coupon be 2 then the customer can use the coupon twice. Second field i.e. Limit usage to X items lets you enter the number of products on which coupon will be valid. For example When you set Limit usage to X items be 5 , so when customer add more than 5 products in cart coupon becomes invalid. To apply coupon on all products leave this field blank. Last field in Usage limits is Usage limit per user that allows you to set how many times a user can use a coupon. This is generally used when a new user sign up and got a coupon. So the user can use the coupon only once. Now your coupon is ready, click Publish to publish your first coupon. First, click Visit site on the top left corner of the screen to go to your site. Add a product by clicking button Add to cart below any product. Now Click View cart to see item selected by you. Add more products to the cart by clicking button add to cart. You can see the list of selected products in cart. Total cost of products selected by you is $161. Now after applying the coupon code the amount is reduced to $128.80 i.e. $32.20 less than the original price. You can also display the coupon code on the homepage of your store so that customers can avail the discount during purchase. You can also inform your customers about special offer through email and social media. 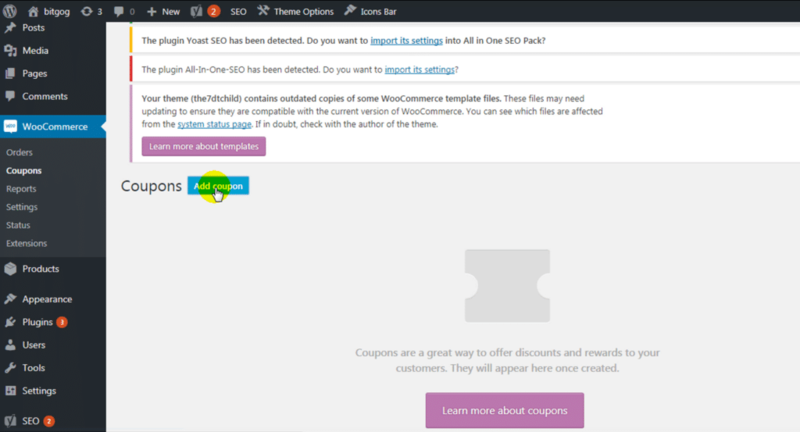 So that’s how you can add a coupon code in WooCommerce. Would you please post your opinion or queries or feedback below.